This summer the north is on fire. 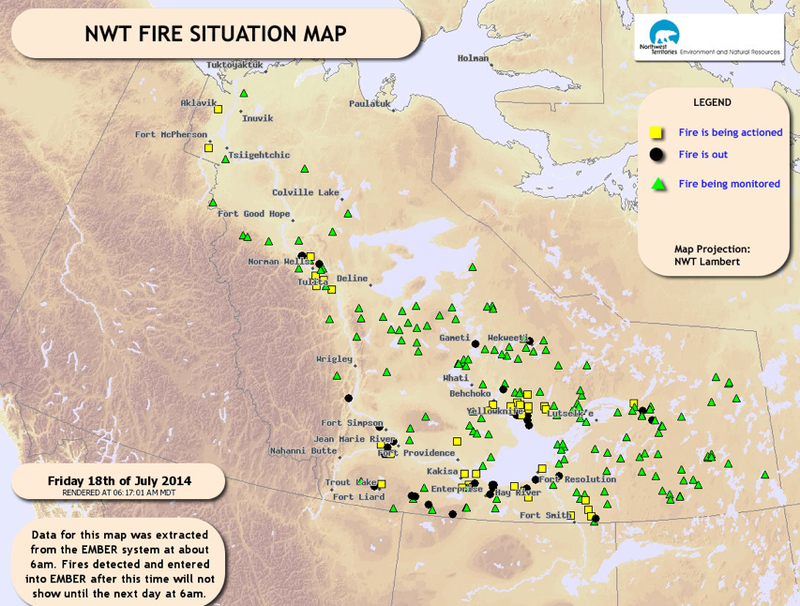 The Northwest Territories is experiencing dry conditions, and there hasn’t been a fire season like this is over 30 years. Over 1,000,000 hectares has burnt so far, with no end is sight. That’s an area about 1/3 the size of Belgium. Currently the road out of town is closed, and the fire has been threatening the cables that provide internet and cellular phone coverage to Yellowknife. Our days are a times filled with dense smoke, depending upon the wind direction, and a couple of days ago everything outside was covered in dark ash. One horrifically dark cloud of smoke blew past the other day, so dark that it completely obscured the sun, and I could see first hand how the dinosaurs died out. As you can imagine, its not quite the idyllic summer of camping I’d imagined. But for others, its much much worse. We were very saddened to hear recently that Olesen family has lost their home to wildfire. 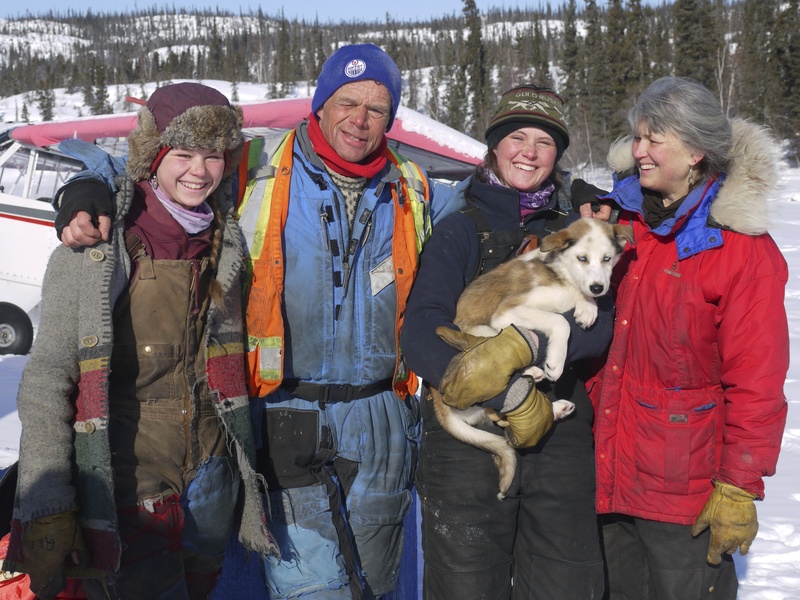 You may remember me introducing this amazing family back in the spring, when we went out to the Olesens’ home on the Hoarfrost River for a week of dogsled mushing and winter camping on the tundra. The family live some 200 plus kilometers away from town, on the edge of Great Slave Lake, in a homestead they have built by hand, and built up, over 27 years. Not only is it their home, but also their livelihood, as they offer dog sled tours in the winter with some of their 45 sled dogs. I was very captured by the experience of meeting this family, who are living an unusual lifestyle, and yet seem to have found a life filled with what matters most. It’s a life close to nature, requiring independence and strength, without any of the usual safety nets we take for granted. Friday, July 4 was an unforgettable day of terror for Kristen Olesen. On that fateful day she and her family lost their three-storey home and separate guest house when all the land around their idyllic location on the East Arm of Great Slave Lake was razed by wildfire. A giant forest fire eating up the eastern tip of Great Slave Lake around the sacred Dene site, the Old Lady of the Falls, was being watched closely and a bit fearfully by the Olesens at their lovely wilderness homestead near the mouth of the Hoarfrost River. The closest edge of the fire was about 10 km away to the east, “just sitting there.” It had been like that for four days. After re-checking the location and (lack of) activity of the fire, they decided it was okay for Kristen’s pilot husband Dave Olesen to leave with his float plane on a charter contract. Their two daughters were with friends on a canoe trip. Kristen was there alone, tending the place along with the 45 huskies they use for dog team adventure outfitting in winter. “The game changer was when I woke up on Friday morning and the winds were from the east,” she told The Journal. “I called the (fire emergency line) a number of times in the morning with varying degrees of concern. She said the winds started to build and by the afternoon were strong, gusting to 80 km per hour. The fire was racing towards her. Olesen said in the thick smoke the bombers could not see where to make the drop. She saw them circling briefly through a break in the smoke, but they could not see her or the buildings. While talking to the pilots on her VHF radio, they offered a heartfelt apology that they were powerless to help her. Meanwhile she was trying to save herself and the dogs. “I was weak in the knees. The winds were so strong. I struggled to get the boat out into the water and around to the shelter of the lee shore,” she recounted. Olesen herded the dogs across a spit of land to an island and managed to get the boat organized in the wind and crashing waves. She said she left the computer and internet system on in the house, took her laptop with her in the boat and was able to connect to a wireless signal, sending a panicked email to friends. The dogs, treasured family pets and the basis of their outfitting company, were running around the small island, stressed and panicked. In the melee, two of them perished in a fight. Soon neighbours Roger and Libby Catling and Roger’s daughter and son, Winnie and Gus, showed up in their boat. They had made it across the rough water and found their way along the shoreline. They saw her on the island with the dogs and joined her. Olesen said they watched the guest cabin burn. Then they saw the house explode in a fireball. She said they could see the fire moving toward their second bushplane, a Bush Hawk, which was moored down the shore near the fuel cache. They knew they had to move it away before the fire ignited the fuel and destroyed the plane. “I was a bit in shock by that point,” Olesen said. Working together with three motor boats, they freed the plane and managed to tow it with the biggest boat slowly to a sheltered mooring beside another small island, away from the fire – no small feat in rough water. Meanwhile, a helicopter with firefighters dispatched from Yellowknife arrived. It had crept along the shoreline looking for them and finally observed the fuel cache, put down there and set up a protective sprinkler system. Olesen said they were not aware of the other buildings, which were not visible in the smoke, so her neighbour boated over to them and told them about the large workshop, storage shed and other outbuildings that make up the homestead. The firefighters moved quickly to set up protection for those as well. “I want to commend them on their persistence and bravery,” Olesen said. The life the Olesens enjoyed had been as perfect as one could want, situated in the pristine Northern Canadian wilderness near a beautiful little river where it flows into the picturesque East Arm of Great Slave Lake – a loving family in a home and business built up over 27 years. Gusting winds created the inferno that destroyed much of it, a meteorological phenomenon called a “low level jet” by forest fire fighters. “It was a perfect storm of fire, wind, location and, I guess, poor communication,” observed Olesen. “The land all around us is devastated. Unlike anything we know. Devastated. At this point we are taking it a day at a time,” she said, emotionally. Dave Olesen flew home as soon as he heard about the fire but encountered a wall of flames and smoke and had to fly around behind the fire and come in from the North, then taxi a long way across a lake to get back to the homestead. Their daughters Annika and Liv arrived back from their canoe trip a few days after the fire. Their canoeing friends stayed for a while to keep them company, which was “a blessing,” their mother said. Abandoning the place after the tragic loss was out of the question. Now, a week later, they have started to plan how to rebuild what they once had. The tools and gear have already been removed from the large workshop, which has become their temporary living quarters – possibly for the next two or three years. Plans are being made for a new guest house and timber frame home, and a barge due in about a month will likely bring materials. Dave was interviewed by CBC news, and you can hear his words here. “There is literally almost nothing left to burn. I know Kristen will post some photos soon. Be sure you who know our home landscape are sitting down and breathing calmly when you open them. She likened it to having someone you love suddenly horribly disfigured. You know that you still love them but it prompts you to examine the layers and nuances of that love, and of beauty. [And yet]…I still hold to the notion, as does Kristen and as do our girls, that “Some people in this world have real problems. This, lest we lose perspective, is not a real problem”. I give thanks that Kristen, Dave, Annika and Liv, and most of their extended family members, the dogs, are fine. The local community has been admirable in their response – there are long lists of things on offer, including air support, work crews, dog yards and funds. Emergency rations have been dispatched, and help given to set up the electronic connections of communication. Many people who know this fine family want to support them, and probably one of the best ways to do this is financially. A local accounting company has set up a trust fund and I expect the money is pouring in. (Dave and Kristen have accepted this on the condition that any unspent funds will be paid forward, to someone else in need). One thing I have learned about loving, and losing, is that the gifts of grief are many. The people we know, both old friends and new, and even the strangers, who come out of the word work to offer support, and love and friendship, to witness our pain and to walk beside us. These are the real gifts of grief, the community we discover when we are most in need. This entry was posted in Uncategorized and tagged Dave Olesen, Forest fires, Great Slave Lake, Hoarfrost River Homestead, Kristen Olesen. Bookmark the permalink. All I can say is our thoughts are with you all. For some unknnown reason we never think of the Great Northwest aflame. But everything every where is different this year. Bless. Paradise lost,though with people such as the Olesons,it will return. Our very best wishes of encouragement to the Olesons family. Thanks so much Wally and Val for your thoughts. I’ve already passed this on to a couple of friends in Canada. One, who lives in Portage la Prairie, near Winnipeg, says they can see the smoke from the NW territory fires when the wind is right. I’m just so sorry — for this particular family, and for all of you. During the terrible drought, when fires were raging through Texas, it was horrifying. The Bastrop fire was one of the worst, and one of the saddest. Not only were homes and businesses lost, an entire stand of loblolly pines — a unique bit of biodiversity — was lost. There’s a well-supported replanting effort going on. You can read about that here, if it’s of interest. I hate the idea of fires raging through Texas. I was in Northern Australia on Black Tuesday, when a fire storm ragged through South Australia and about 300 people, nearly an entire village, died because the fire came on them so fast they had no warning at all. It makes me so sad to remember reading the horror stories in the paper. Many folks die in Australia trying to defend their properties, so I was really glad that Kristen took to her boat and the water when she did. You are so right about the Olesens. And what an interesting observation, that only someone in the ‘real world’ could say that. It makes me wonder if the rest of us, the majority of us, caught up in our social busyness, are living in the real world. I’ve been wondering if I am ever present in my daily life – I can’t remember what I did, ate or said yesterday, never mind last week and last month. Its a bit of a wake up call. Blessing to you and Texas Linda! This story brings tears to my eyes. I feel a kinship with Dave and Kristen for a couple reasons. I live at the opposite end of Great Slave Lake, tip of the North Arm shoreline. My husband and I also have a small lodge home that we too built ourselves. Although it is a different style and we have access to a highway, the intent was similar. I also pulled up roots from the land of my birth to live my life here in the Boreal forest. We too have experienced a recent crisis…different but none the less a crisis with our home and business. I send my heart felt wishes to the Olesen family. Joyce, thanks for sharing your story and your wishes. I will pass them on. And all the best to you.